Fearless counterterrorism operative Mitch Rapp finds himself directly in the line of fire in the latest riveting political thriller from New York Times bestselling author Vince Flynn. For years, Mitch Rapp's bold actions have saved the lives of countless Americans. His battles for peace and freedom have made him a hero to many, and an enemy to countless more. In the tangled, duplicitous world of espionage, there are those, even among America's allies, who want to see Mitch Rapp eliminated. They have decided the time has come. Now, the powerful father of a dead terrorist demands vengeance in its simplest form -- an eye for an eye, and Rapp instantly becomes the target of an international conspiracy. This time, he must use all of his vigilance and determination to save himself before he can turn his fury on those who have dared to betray him. Consent to Kill takes listeners behind the headlines and catapults them to the front lines of the global war on terror. It sizzles "with inside information, military muscle, and CIA secrets" (Dan Brown). Vince Flynn mixes military technology with his exclusive knowledge of Washington politics to create a hero that Americans will wish existed outside the realm of fiction. Vince Flynn was a graduate of Saint Thomas Academy in 1984 and the University of St. Thomas in 1989. After graduating, Flynn went to work for Kraft Foods as an account and sales marketing specialist. In 1991, he left Kraft to pursue a career as an aviator with the United States Marine Corps. One week before leaving for Officer Candidate School, he was medically disqualified from the Marine Aviation Program, due to several concussions and convulsive seizures he suffered while growing up. He had also been diagnosed with dyslexia, so in an effort to overcome the difficulties of dyslexia, Flynn forced himself into a daily writing and reading regimen. His newfound interest in such novels motivated him to begin work on a novel of his own. While employed as a bartender in the St. Paul area, he completed his first book, “Term Limits”, which he then self-published. The book went to number one in the Twin Cities, and within a week had a new agent and two-book deal with Pocket Books, a Simon & Schuster imprint. October 2007 marked another milestone in Flynn’s career when his ninth political thriller, “Protect and Defend”, became a #1 New York Times bestseller. A few months later, CBS Films optioned the rights for Flynn’s Mitch Rapp character with the intention of creating a character-based, action-thriller movie franchise. Lorenzo di Bonaventura, as head of production at Warner Bros., and Nick Wechsler will produce the films. 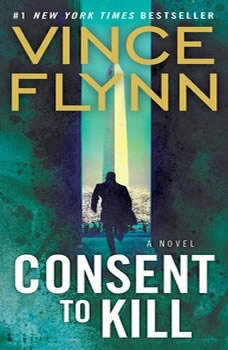 Works by Flynn include American Assassin, Kill Shot, Transfer of Power, The Third Option, Separation of Power, Executive Power, Memorial Day, Consent to Kill, Act of Treason, Extreme Measures, Pursuit of Honor, The Last Man, The Survivor and Term Limits (not part of the Mitch Rapp series). He also served as a story consultant for the fifth season of the television series “24”. On June 19, 2013, Vince Flynn died after a three-year battle with prostate cancer. He left behind his wife Lysa, whom he described as "My favorite thing about life," and their 3 children.